Carlisle Cathedral boasts a peal of 12 bells, but it hasn’t always been this way. When the diocese of Carlisle was founded in 1133, the Augustinian Priory Church of the Holy and Undivided Trinity became a Cathedral. 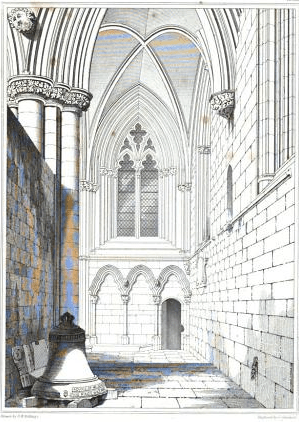 Mentions in the “Lanercost Chronicler” state that there were bells in the Cathedral in 1292 but in the late 1300’s it seems the central spire blew down following a storm, damaging the tower and north transept. It is thought that the original bells would have been destroyed at this time. +IHC+IN:VOCE:SUM:MUNDA:MARIA:SONANDO:SECUNDA which translates as; ‘I, Maria, with pure accents ring, second in the chiming ring’. These four bells are considered to have survived the English Reformation as they are mentioned in the 1552 inventory. In 1608 a fifth ‘b’ was, cast by George Lees and Edmund Wright, with the inscription; ‘ Jesus be our speed George Lees Edmund Wright Bel Founders Will Orbel LM 1608’. The third, a sharp, was cracked while ringing during the rejoicings for peace after the battle of Waterloo and was removed to the back of the altar when the belfry was re timbered. It has the following passage on its rim ‘This ringe was made six tuneable bells at the charge of the Lord Howard and other gentree of the county and citie and officers of the garrisson by the advice of Majer Jeremiah Tolhurst governor of the garrisson 1658’. The fourth ‘b’ is inscribed as follows ‘Jesus be our speed George Lees Edmund Wright Bel Founders Will Orbel LM 1608’. The fifth ‘c’ has on it ‘Geor Fleming DD Decanus Gloria in Altissi mis Deo 1728’. By the time of the Restoration, Carlisle Cathedral had ‘six tuneable bells’ and a system of chiming was also installed. One of the features of ringing at this time was the Sermon Bell, rung to call Dissenters to listen to the sermon. The second bell was found to be cracked in 1728 and this was recast by Edward Sellar of York. This ring of six bells would have sounded to welcome Bonnie Prince Charlie when he entered Carlisle in 1745, following the capture of the city by the Jacobites. The Duke of Cumberland’s forces took the Castle and Carlisle city only three weeks later in December, demanding surrender of the Cathedral bells. However, his demands were not met and as a result, it is said that he banned the ringing of the bells as a complete peal for 100 years. In 1747 a new chiming apparatus was installed and played the tune ‘St. David’s’ each day at 8.00am, noon and 4pm. ‘…from the supposition that the ringing of the bells shook the tower it was resolved not to ring them any more. Small cords were then attached to the tongues over pulleys and conveyed through the groining to the floor of the tower and one person can now comfortably make the whole give a faint sound’. In 1845, the 4th bell, which dated from 1659 was found to be cracked and was recast by C & G Mears. Several years later in the 1850’s, Dean Tait appealed for money to restore the bells, but nothing further was done. It appears that the bells remained in this condition until the early 1900’s, as records indicate that Queen Victoria wrote to ask if the Duke of Cumberland’s ban has been the reason why the bells had not been rung for her Diamond Jubliee in 1897, and a later report in 1915 describes three of the bells with no wheels or ropes and the other three being ‘clocked’ only. Writings by The Rev. H Whitehead in the 1880’s relates the history of the bells and suggests that there should be a ring of eight in the tower, adding that ‘there is ample room for a dozen or more’. The Very Rev. Hastings Rashdall, Dean of Carlisle from 1917 to 1924 showed a keen interest in restoring the bells and when he died his widow offered to have them rehung and two new trebles added in his memory. In 1925, Whitechapel foundry refitted and tuned the existing bells and added two new bells to complete the octave. New chiming apparatus was put in place, programmed to sound the opening changes of Grandsire Triples. Since 1925, the bells have been rung regularly on the anniversary of Dean Rashdall’s birth, the 24th June. Eight bells being cast by five different founders and dating between the 15th and 20th century, resulted in poor tonal quality, so much so that they earned the doubtful reputation of being the ‘worst Cathedral bells in England’. Plans to improve the situation came to fruition with a Millennium grant, which combined with a legacy and other funds, allowed the bells to be taken to Taylor’s Bell foundry in Loughborough in the spring of 1999. Ten new bells were named after northern saints, baptised on the 1st August 1999 by the Very Reverend Graeme Knowles, Dean of Carlisle. 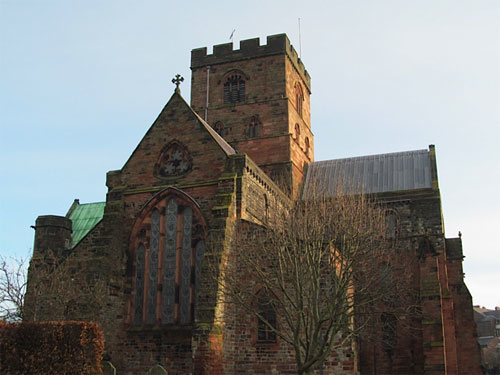 The following week, the bells were raised to the belfry and on the 3rd October 1999, the new ring was dedicated by the Right Reverend Ian Harland, Bishop of Carlisle. Two treble bells were added in November 2000 and a sharp second bell joined this ring in July 2005. Carlisle Cathedral now has a ring of twelve bells (thirteen including the sharp second), with a peal tuned to the key of E flat. The dedicated band of ringers now believe that Carlisle Cathedral has the best bells in the country!